Speculation is reaching an all-time high as to whether or not Vice President Joe Biden will announce a campaign, and much has been pondered about how an announcement could potentially affect Hillary Clinton — but what would happen to Bernie Sanders if Biden runs? The vice president has been very clear that he'll make up his mind by late summer, and time is starting to run out. Recent meetings with prominent Democrats such as Massachusetts Sen. Elizabeth Warren have added fuel to the rampaging rumor fire. For his part, Sanders doesn't seem too concerned about Biden's meeting with Warren, or his potential campaign in general. "Politics is not a soap opera," Sanders told reporters in New Hampshire on Monday. "We should not be going around making terrible attacks on each other. Let's debate the issues. If Joe comes in, that's what I will do." In typical Sanders fashion, he's not getting too nervous about Biden's impending decision, or what it will mean to him. "What impact it will have on the race I honestly don't know," Sanders said Monday. "I mean, I wish I could tell you but I don't. Will it help or hurt me? Will it help or hurt Hillary Clinton? I just don't know." But the truth is that if Biden does decide to throw his hat in the ring, it could end up going very well for Sanders. Though he is currently trailing behind Clinton in most polls, Sanders' chance of winning the nomination would likely rise if Biden entered the race. As Chris Cillizza of The Washington Post points out, Clinton and Biden are similar candidates. "Consider: Biden and Clinton occupy lots and lots of the same space within the Democratic Party," Cillizza writes. "Establishment figures. Decades spent in Washington. Pragmatic rather than ideological." If Biden enters the race, the majority of support would come from those who were previously team Clinton. Because Sanders lies firmly on the other side of the Democratic spectrum, it's unlikely that many of his supporters would defect to Biden. Currently, Sanders is polling well, but when compared to Clinton's polling success, his numbers look grim. But if Biden decides to run, Clinton will suddenly have to share her numbers — thus allowing Sanders reason to hope. Also consider how the landscape of the primaries will change: it will no longer be powerhouse Clinton against grassroots Sanders. 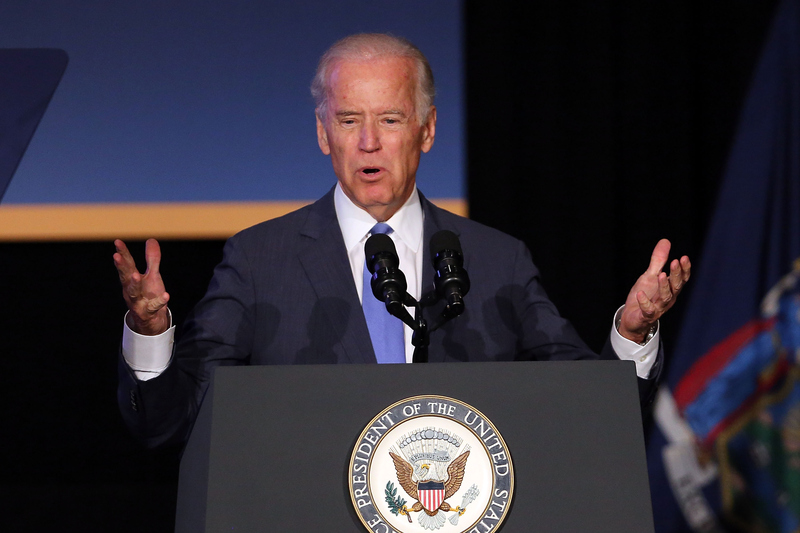 It's likely that if Biden decides to run, his campaign will be well funded, like Clinton's. And because the two occupy a similar space, they will have to spend time, energy, and lots of money showing how they're different. There's a solid chance that Sanders could sit back, continue doing his thing, and let Clinton and Biden beat each other down. Voters who are put off by large scale campaigns and who were already on the fence with Clinton could come flocking to Sanders' camp. Like Sanders, no one knows what will happen, and predicting politics is about as simple as herding cats. But, though Biden's campaign could signal trouble for Clinton, it could be exactly what Sanders needs to propel himself through the primaries. According to CNN, sources close to the vice president say Biden is more likely to run than not. A decision will likely be announced in late September or early October.